Bhubaneswar: It was not so much difficult for heritage and nature lovers to wake up at 4:30 AM and get prepared to have a look at the outskirts of the millennium city of Cuttack. The journey started at 6:15 AM. The first site was the Peacock Valley near Naraj, commonly known for the Naraj Police Firing Range. 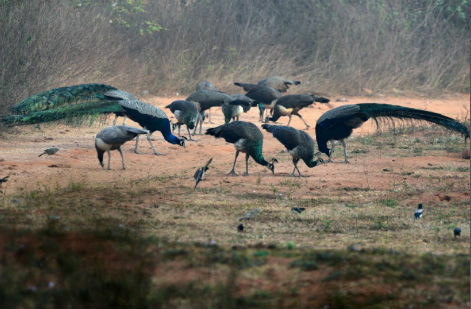 “During 1999 super cyclone, two peacocks and one peahen from Chandaka Forest area came to this place for shelter. My grandfather Mr. Panu Behera took care and now this family is more than 100”, says Mr. Kanhu Ch. Behera, who is now a caretaker for the Peacocks. “I came to this place near about one year back and met with Mr. Panu Behera. I really got fascinated by seeing his dedication. This place can be developed as a spot for wildlife and nature lovers as the combination of mountains, forest and Peacocks will surely fascinates you. The scenic beauty of Naraj will also attracts you”, said Ashish Sarangi, one of the organizers of the tour under Kalinga Diaries name. Then the visitors moved towards the second spot nearby at Siddheswar temple, Talagada. Situated on the hill top, this temple is really a mixture of old heritage and scenic beauty. “Siddheswar is one of the Ashtasambhu in the area. The temple was basically a cave and you can see the newly built structure over it. In the compound there are two or three small caves still exist. The hill top view of Munduli Barrage & Mahanadi river is really beautiful”, said Prateek Pattnaik, another member of the organizing committee. The next stoppage was Rameswar temple. Situated near Mahanadi river, this temple was built during Ganga period. ” The temple is really wonderful and I am really impressed” said Dr. Kartik Herkal, a visitor with a keen interest on Odisha’s scenic places. “I am really surprised to see such kind of hidden treasures we are having near twin cities and I really appreciate the efforts of the organizers” said Mr. D.K.Pattanayak, an ex-banker. The last stoppage was Dhabaleswar temple. All persons were fascinated by seeing the various antiquities and natural beauty the location possessed. Situated in a island in the Mahanadi, this temple is really an tourist’s delight. The hanging bridge, the boat riding and the famous dahi bada- aloodum, people enjoyed everything here very much. “I had attended their previous two tours also and every time I see new things. From scenic beauties to temples to wild life, this is a memorable tour for me” said Kumarika Mohanty, who came with her father and her little daughter. “I am attending such kind of event for the first time and I am speechless by seeing such spots within our reach, yet lying hidden”, said Surajit Mishra, a software engineer. “Since summer season is approaching, we are working on our strategy and timings, so that people who are enthusiastic for such tours, can comfortably attend. We will soon disclose the dates of our next tour with some surprises” said Taranisen Pattnaik, another member of the organizing committee. Kalinga Diaries is a start-up by three touring enthusiasts to get people to the lesser known, hidden monuments of Odisha. Founded by a dedicated team determined to make more people aware of the unexplored side of Odisha, the startup’s maiden trip was organised on 24th December 2017 to Prachi Valley, near Bhubaneswar . The founders are Ashish Sarangi, an engineer by profession but also a self-made expert in Odisha’s ancient history & Kalingan architecture, who has extensively toured through ancient Kalingan sites for years; Taranisen Pattnaik, an accountant by profession who has been passionately capturing intimate shots of Odia culture through his camera; & Prateek Pattanaik, a physics undergraduate who researches into Odisha’s temples, music and literature and has been digitally documenting them for posterity. Till now four successful tours have been organised by them including on exclusive tour to lesser know places of Jajpur district. The concept and its unique approach have been well-received on social media and elsewhere. More details can be found at the website www.kalingadiaries.com, through the social media handles on Facebook (facebook.com/kalingadiaries), Twitter (@kalingadiaries) and Instagram (@kalingadiaries) or via email at [email protected].